- Moc: cast iron, cast steel(wcb), stainless steel ( cf8/cf8m/cf3m), gun metal. G. M. Engineering Pvt. Ltd. 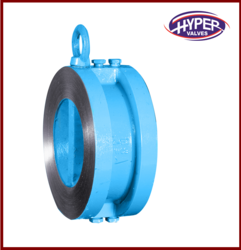 In order to cater the variegated demands of our clients, we are offering an excellent quality range of Dual Plate Check Valves. - Seat: Metal to metal seal/rubber to metal seal. - Pressure rating: cl-150, cl-300, pn 1.0/1.6. Sizes: From 2" To 80" Diameter. 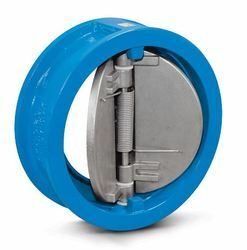 The dual plate check valve is an all purpose non return valve that is very durable, lighter in weight and smaller in comparison to a conventional swing check valve or lift check valve. We also offer Dual Plate Check Valves, which are manufactured in compliance with defined industry standards. Fine in finish, these are appreciated by clients not only for corrosion resistance but also for dimensional accuracy. Prior to delivery, we check these valves on well defined quality parameters. We have in stock around 100 pcs of dual pilot check valve line mounted with 1/2"G connection. Capacity is 60 lpm and pressure 350 bar. We would like to dispose them in one lot at a very competitive price. The body is of Aluminium.